This is a procedure performed at the back your neck; Dr Steel makes a small incision in the midline of your neck and performs a minimally invasive muscle dissection to expose the level of where your nerve or spinal cord is compressed. This operation involves creating a window between two vertebrae. The foraminotomy is made over a nerve root to alleviate pressure on your nerve. 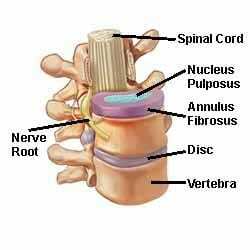 The nerve may be trapped by bone overgrowth, or spurs (osteophytes) or there may be a disc protrusion which is pressing on the nerve. Foraminotomy can be done with an endoscope or a microscope. 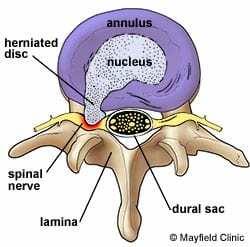 If the disc fragment is removed this procedure is called a microdiscectomy. Following anterior cervical discectomy and fusion, or an artificial disc replacement, you are encouraged to walk the day after your surgery. Your neck is stable and it’s best to mobilise it as soon as possible, within the limits of discomfort. Most patients will have mild swallowing difficulties immediately after surgery. This usually resolves over a few days. Hoarseness is also possible following this surgery, but very rare. It usually occurs with surgery at the lower-most disc, as at this level that there is a nerve that controls the voice box. There are usually no stitches to remove; the stitches are buried and will be reabsorbed and dissolve with time. You can shower with the dressing on the first two days after surgery. Dressings are removed on the third day and can be left open. The wound should not be soaked – such as swimming or sitting in a bath – for one week after your operation. After surgery it is not uncommon to have various aches and pains in and around the wounded shoulders. This should improve over 6 to 12 weeks. In the first two weeks after surgery, mild nerve pain may persist because of nerve swelling. Recurrent pain usually resolves within two weeks. If the pain is severe, please contact Dr Steel so he can consider prescribing dexamethasone (a strong anti-inflammatory steroid medication). You will return for a review after six weeks. Avoid heavy exercise and heavy lifting for six weeks after the surgery, at which time you can resume normal activities. Following cervical spine surgery, about three percent of patients per year develop problems at the adjacent level: 20 percent of patients require surgery at adjacent levels within 10 years. There is risk with any surgery. Simply cutting the skin exposes the body to infection and bleeding. The more complicated the operation, the greater the risk. For all surgery, risks include infection and post-operative bleeding. While bleeding during an operation can be a problem in major surgery, the bigger risk lies after surgery when bleeding can recommence. While infection or bleeding complications do not mean your surgery has failed, but if they occur it could mean you need another operation, sometimes urgently. There is also a risk of death or paralysis with any brain or spinal operation, but this is extremely rare. This may be a simple infection of the wound, which requires dressing, removal of a stitch or antibiotics. Deeper infections may require a return to the operating theatre to drain any collection of pus. Infection may also affect the cerebrospinal fluid (CSF) around the nerve roots and spinal cord. This is called meningitis and requires hospitalisation and intravenous (IV) antibiotics. It is virtually always curable. Infection of an operated disc space or of a bone often requires hospitalisation and IV antibiotics and several weeks or months of oral antibiotics, often supervised by a microbiologist or an infectious diseases doctor. The infection does not mean failure of the surgery and the patient will usually recover without problems. Prior to surgery there may already be some nerve or spinal cord damage causing muscle weakness. For example, a nerve or the spinal cord may be squashed or compressed. This increases the risk of injury because manipulation is needed to free the nerve or spinal cord. Nerve or spinal cord damage can also affect control of the bladder and bowel. The brain and spinal cord are surrounded by CSF, which is salty and looks like water. CSF leaks occur if the outermost layer of the meninges (the three outer coats of the brain and spinal cord) called the dura, is not closed water tight. CSF can leak through the dura and then through the skin. This must be repaired to remove the potential risk of meningitis. Just like a leak in a roof, there only needs to be a small hole in the dura for CSF to leak. This can be difficult to repair. It may require a simple skin stitch, a spinal drain tube, or further surgery. DVT involves a blood clot developing in the leg. The patient may notice painful swelling of the calf, but a DVT may not be big enough to be noticed. For patients who spend a lot of time in bed after surgery, Dr Steel can conduct routine surveillance with ultrasound. The danger with these clots is that they may dislodge and travel to the lungs or heart to block circulation. This is known as a pulmonary embolus. A pulmonary embolus can be fatal and usually occurs about one to two weeks after surgery. Occasionally, it can occur when the patient starts to walk after being in bed for a prolonged period. Bed rest, prolonged surgery, obesity, cancer, previous DVT, paralysed legs and heart failure carry increased risk for DVT and pulmonary embolus. To prevent DVT, Dr Steel encourages you to get out of bed as soon as possible after your surgery. If you spend significant time in bed, you should wiggle your toes and move your legs around in bed as much as possible. Prior to surgery, patients are fitted with elastic stockings. During surgery patients have calf compressors that improve circulation. In some cases, blood thinning injections (anticoagulants) are used to prevent thrombosis and pulmonary embolus.